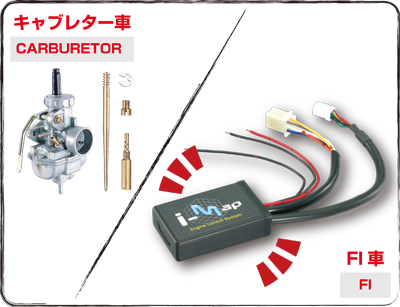 Carburetor is so simple ! 従来のキャブレターではスロットルバルブを上下にスライドさせる事で空気流量を調整し、その負圧によって吸い出された燃料を空気と混ぜ合わせる事で混合気を作る、いたってシンプルな構造となっています。 Carburetor slides throttle valve up and down to adjust air amount. 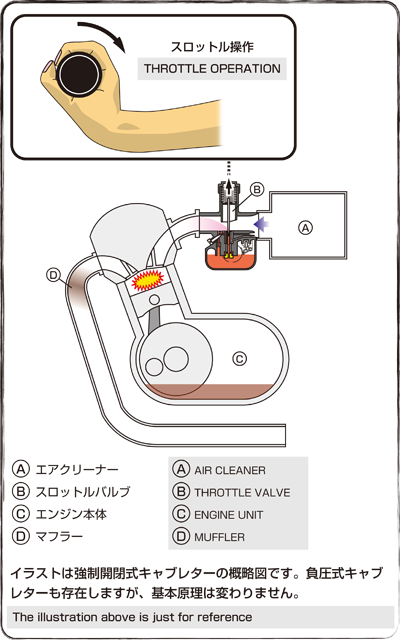 The air with fuel coming inside the carubetor will become air-fuel mixture, which has so simple construction. FIでは少々構造が複雑となり、バタフライバルブを開閉させて、空気流量を調節すると同時にインジェクターから燃料を噴射させて混合気を作ります。その燃料噴射量はエンジンの状態を各センサーが読み取り、瞬時にエンジンコントロールユニット（以下ECU）が演算して、エンジンの状況に応じた最適な燃料噴射を行います。 FI has a little bit different construction. It opens / closes butterfly valve, adjusts air amount and injects fuel to make air-fuel mixture. Each sensor reads its amount for Engine Control unit (ECU) calculate the best amount according to engine condition. 大排気量スポーツモデルとなるともっと複雑になります。車速センサー、ホイール回転センサー、ギヤポジションセンサー、加速度センサー（車体の挙動）等が装着されています。これにより、さらに緻密な制御が行われ、出力特性を瞬時に変更できる、いわゆるトラクションコントロールやパワーモード機能等につながっていく訳です。 For big displacement sports model, speed sensor, wheel revoluion sensor, gear position sensor, acceleration sensor (body movement) and so on are already installed. With these function will lead to more sensitive controls such as tracion control system or power mode function. FI車もキャブレター車同様で、エンジンチューニングやエアクリーナー等の交換により、吸気量が増加すると燃料供給量のセッティングを行わないといけません。 Just like carburetor model, FI model requires air / fuel adjustment when engine tuning / air clearner exchange have been done. 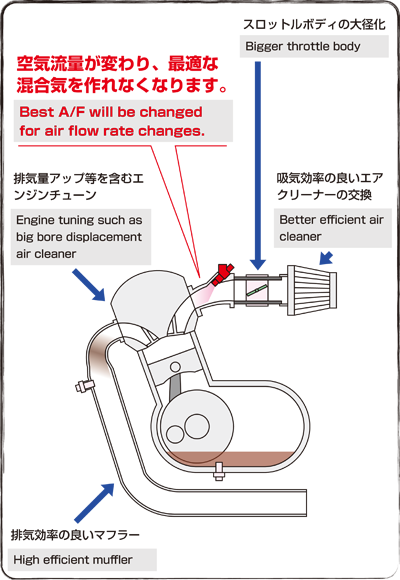 Then, how do I adjust air / fuel adjustment? 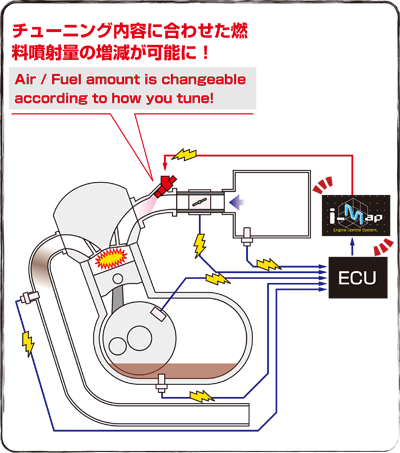 FI requires "fuel injection program" for air / fuel adjustment, such as "I-MAP". I-MAPはノーマルのECUを介して、燃料噴射量を増減させるサブコントローラーとなります。 "I-MAP" controls air / fuel amount together with stock ECU. Best air / fuel amount is up to you. I-MAPには当社パーツの組み合わせで最適となる燃調マップを予め数チャンネル、プリインストールされているので、本体のディップスイッチを切り替える事で当社のチューニングメニューに合った燃料噴射が可能となります。 A several type of best channels & maps for some Kitaco parts are already pre-installed when shipped. 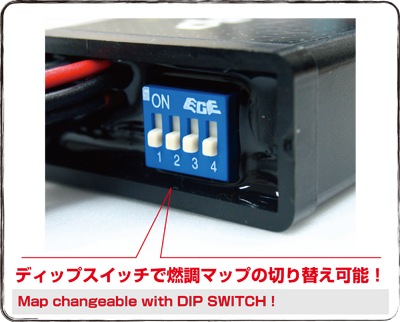 By changing DIP switch on I-MAP body, you can get best tuning map with Kitaco tuning parts. Making your own original map ! ※但し、燃料噴射を増量設定してもインジェクターの能力を超えての燃料噴射はできません。 There is a blank map to make your own map as map for other manufacturer's parts is not pre-installed. 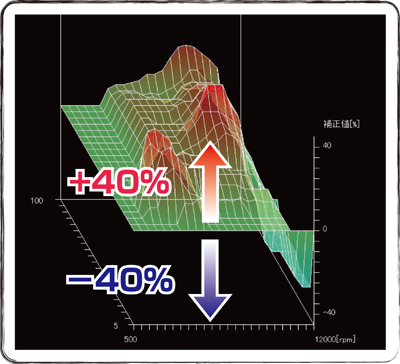 Making own map in ±40％ range based on OEM map is possitble, which is so easy to understand. * But injecting beyound injector ability is not possible even if adjusted. 次の項目はオリジナル燃調マップの作成にあたっての、必要な物、準備を解説していきます。 Next chapter is about Requirements & Preparation for making original map.